SINGAPORE: The publicised visit to a Malaysian vessel illegally anchored in Singapore’s waters staged by the Johor Chief Minister was an intrusion that “undermined the goodwill and trust necessary for further co-operation between the two countries”, especially in terms of working with Johor, Singapore Foreign Affairs Minister Vivian Balakrishnan told the House today. Delivering a ministerial statement in response to a slew of questions filed by Members of Parliament on the bilateral disputes, Balakrishnan also said that the Attorneys-General (AGs) of both countries will meet on an undisclosed date to discuss whether Malaysia has the right to review water prices under the 1962 Water Agreement. A discussion between the AGs in December last year – which was meant to better understand each other’s positions on the issue of water prices – was “overshadowed by the new issues that had arisen over the Johor Baru Port Limits and Seletar Instrument Landing System (ILS) procedures”. “But they will meet again to continue their discussions,” said Balakrishnan. On the latest developments, Balakrishnan said the regrettable visit to the Marine Department Malaysia vessel Pedoman by Osman Sapian on Jan 9 completely “went against the spirit of the agreement” between him and his Malaysian counterpart Saifuddin Abdullah the day before. Balakrishnan’s comments on the disputes came a day after Singapore’s Ministry of Foreign Affairs said the Republic has sent a diplomatic note to Malaysia to protest against the visit, calling it a “provocative act”. Osman’s visit made it “untenable” to proceed with the meeting of the Joint Ministerial Committee for Iskandar Malaysia (JMCIM), Balakrishnan said. The meeting was postponed. On Oct 25 last year, Malaysia unilaterally extended its Johor Baru port limits into Singapore’s territorial waters off Tuas. Balakrishnan stressed that this extension goes beyond even Malaysia’s own territorial sea claims according to its 1979 map, which Singapore has consistently rejected. 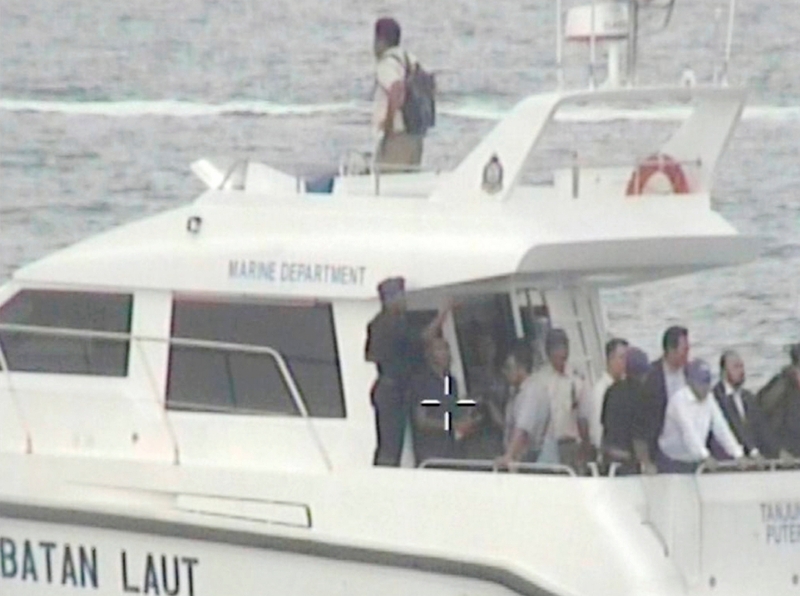 Since late November last year, Malaysian government vessels also started intruding into Singapore’s maritime waters. In response to Malaysia’s provocative actions, Singapore on Dec 6 last year extended Singapore’s own port limits off Tuas. Balakrishnan said this was done in accordance with international law. The new port limits also remained well within Singapore’s waters. On Jan 8, both countries agreed to set up a working group to de-escalate the tensions over maritime borders. It will report to Balakrishnan and Saifuddin within two months. If negotiations are unsuccessful, Singapore is prepared to settle such disputes by recourse to an appropriate international third party dispute settlement procedure. Malaysia has objected to Singapore’s use of the ILS procedures for Seletar Airport. Balakrishnan said Singapore decided to use the ILS at the airport at the request of Firefly, a subsidiary of Malaysia Airlines. Ironically, the Civil Aviation Authority of Singapore (CAAS) was “trying to facilitate Firefly’s operations at Seletar by installing the ILS, which Malaysia has now objected to”, Balakrishnan pointed out. Singapore’s authorities had approached its Malaysian counterpart in December 2017, but received a response almost a year later in November last year. Despite the delay, Singapore tried to address its counterpart’s concerns, Balakrishnan said. Malaysia has also voiced concerns that the ILS will restrict development in the town of Pasir Gudang in Johor, but Singapore said there will be no such hindrance. Shipping activities will also be unaffected. On Dec 25, Malaysia declared a permanent Restricted Area over Pasir Gudang for “military activities”. This would force flights operating to and from Seletar Airport to spiral up and down close to the airport to traverse above the Restricted Area – contravening established International Civil Aviation Organisation’s (ICAO) procedures, said Balakrishnan. CAAS was not consulted or informed of the Restricted Area, which could affect flight efficiency and safety. Following the bilateral meeting on Jan 8, Malaysia suspended the permanent Restricted Area established over the town of Pasir Gudang in Johor Baru, while Singapore has shelved the implementation of the ILS at Seletar Airport for one month. The mutual suspension took effect at midnight on Jan 9, allowing normal operations to resume at Seletar Airport. Balakrishnan said that Malaysia has also expressed its intention to review the 1974 Operational Letter of Agreement on airspace arrangements in southern Johor. Singapore, in response, said that it would review Malaysia’s proposal when it has received it. Such discussions on air navigation arrangements, he noted, involve consultations with international stakeholders and cannot be done overnight. But in the meantime, air traffic operations must continue in the interest of civil aviation safety, Balakrishnan said. This means operations have to be based on current arrangements and in accordance with ICAO requirements, he added. The AGs of Singapore and Malaysia will meet again to discuss whether Malaysia still has the right to review water prices under the 1962 Water Agreement. The agreement expires in 2061. Malaysia’s Prime Minister Mahathir Mohamad had raised the issue with Singapore’s Prime Minister Lee Hsien Loong when they met in November last year. Both subsequently agreed that the countries’ AGs would meet for discussions. Though both AGs met in December last year, the talks were “overshadowed” by the disputes over the Johor port limits and the ILS procedures, said Balakrishnan. “Had a good chat with Minister Azmin Ali! He is in town to meet old friends. Naturally, we talked about our common project, the deferred High Speed Rail between KL and Singapore. He is aware of the unnecessary disputes at Tuas and Seletar. We share a common desire to bring bilateral relations back on track, so that good projects, like the RTS Link between Woodlands and JB, can materialise, to benefit both our peoples.” – Singapore’s Transport Minister Khaw Boon Wan on Facebook, referring to a meeting on Jan 14 with Malaysia’s Economic Affairs Minister Azmin Ali.